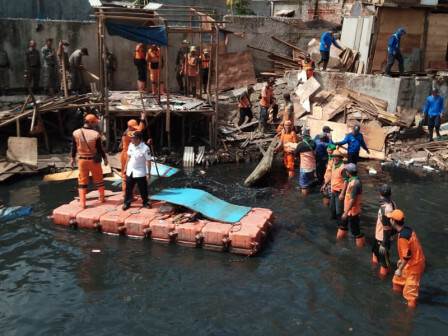 15 illegal buildings stood atop the Item riverbank, Angke Urban Village, Tambora, West Jakarta were demolished by joint personnel of PPSU, Satpol PP, police and army, Wednesday (11/14).
" We are worried that there will be a floodwater, that's why we demolish these buildings"
Tambora Sub-district Head, Djaharudin stated that it was done to anticipate the upcoming floods during the peak of the rainy season in January 2019. "We are worried that there will be a floodwater, that's why we demolish these buildings," he stated. Angke Urban Village Head, M. Dirhamsyah explained that demolishment went smoothly without protest. 3 out of 5 building owners had demolished their buildings by themselves prior to demolishment. "Further, we will coordinate with West Jakarta Water Resources Sub-dept. to dredge mud in the riverbank," he said.